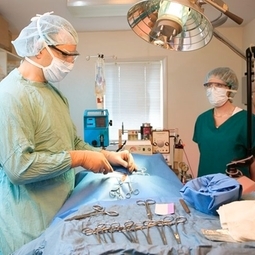 Any surgical procedure requires anesthesia. Anesthesia can have risks, but some precautions can be taken. We strongly recommend pre-operative blood work prior to anesthesia to help identify any unknown pre-existing conditions. This blood panel checks internal organ functions such as liver, kidneys, hydration, blood sugar, protein levels, and electrolytes, and a complete cell blood count to help our doctors fully determine if a pet is healthy and capable of safely handling and properly metabolizing anesthesia. The Pre-Anesthetic Blood Panel is $63.00. Intravenous fluid therapy is recommended to help keep your pet's blood pressure normal during surgery and to help with the elimination of anesthesia by-products. The IV catheter used to deliver the fluids is also an extra layer of security, allowing us immediate IV access in case anything unexpected happens under anesthesia. This treatment is $60.00.